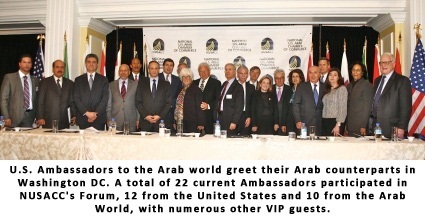 ​The National U.S.-Arab Chamber of Commerce (NUSACC) today hosted a first-of-its-kind Ambassadors' Forum, featuring 12 U.S. Ambassadors serving throughout the Middle East and North Africa (MENA) region. At an afternoon conference that attracted over 300 business and government leaders from the United States and throughout the Arab world, the U.S. Chiefs of Mission provided insights into the pros and cons of U.S. commercial relations with the region, particularly in the context of the Arab Spring. "Our Chamber is honored to host this high-level gathering of U.S. Ambassadors," said NUSACC's President & CEO, David Hamod. "The breadth of their experience, stretching from one end of the Arab world to the other, offers a road map for U.S. companies that are looking to do business in the MENA region." Panel presentations featured current U.S. Ambassadors from 12 nations: Algeria, Bahrain, Egypt, Iraq, Kuwait, Libya, Morocco, Oman, Qatar, Saudi Arabia, Tunisia, and the United Arab Emirates. Collectively, these nations consume almost 93 percent of all U.S. goods that are exported to the twenty-two nations of the Arab world. The Ambassadors' Forum also attracted current Arab Ambassadors from Algeria, Bahrain, Iraq, Kuwait, Lebanon, Libya, Morocco, Oman, Palestine, Tunisia, and the League of Arab States. Major media were also present, including Al-Hurra TV, Al-Iraqiya, Al-Jazeera, C-SPAN, CNN, Foreign Policy Magazine, the Kuwait News Agency, the New York Times, Reuters, the Saudi Press Agency, the Washington Diplomat, the Washington Post, the Washington Report on Middle East Affairs, the Washington Trade Daily, and more. The three-hour event was divided into two panels. The first panel focused on Economies in Transition, while the second panel concentrated on Diversifying Away from Hydrocarbons. The Ambassadors' Forum was kicked off by Hon. Thomas Pickering, a former Under Secretary of State and currently a member of the Executive Council for the Boeing Company. Ambassador Pickering said, "My congratulations to the National U.S.-Arab Chamber of Commerce for working hard to balance what has been a very unequal situation with respect to the region and indeed to the work of organizations dedicated to the region in this capital." Speaking of the changes in the Arab world, Ambassador Pickering continues to state, "I think it is here to stay. I think it is very significant. I don't know how it's all going to come out and if anybody professes to know so, they probably ought to be elevated to a pedestal or sent to the loony bin... The Arab world has spoken and its people have spoken." ​The Economies in Transition panel was moderated by Hon. Don De Marino, NUSACC Co-Chairman and a former Deputy Assistant Secretary of Commerce. Panelists included: Hon. Thomas Krajeski, U.S. Ambassador to Bahrain; Hon. Anne Patterson, U.S. Ambassador to Egypt; Hon. James Jeffrey, U.S. Ambassador to Iraq; Hon. Gene Cretz, U.S. Ambassador to Libya; Hon. Samuel Kaplan, U.S. Ambassador to Morocco; and, Hon. Gordon Gray, U.S. Ambassador to Tunisia. Ambassador Gray noted, "Tunisia is not only the birthplace of the Arab Spring, but is also an excellent platform for U.S. businesses interested in expanding to markets in North Africa, Europe, and sub-Saharan Africa. I want to thank the National U.S.-Arab Chamber of Commerce for providing me the opportunity to highlight the dynamic trade and investment opportunities available for U.S. businesses." Ambassador Patterson stated, "Our governments are committed to a strong partnership and to building solid foundations for public and private sector cooperation. We are confident Egypt has the right mix of demographics and commercial links to the broader world, strategic location, and a demonstrated ability to innovate and compete in global markets. With macroeconomic stability, Egypt could be one of the leading emerging markets within a few years. We will do all we can to support Egypt as it works to reach its full economic potential." Ambassador Cretz said, "Among the challenges that the new government of Libya is wrestling with is how to restart the billions of dollars worth of infrastructure projects that had been in various stages of development at the start of the revolution. They are currently designing a process to assess the viability of these thousands of contracts and considering how to proceed on new projects as well. We believe that there will be abundant opportunities for American companies to participate in the building of a new Libya." Ambassador Jeffrey stated, "U.S. exports to Iraq increased 48 percent last year, making it one of our most important and fastest growing markets in the Middle East. Clearly, Iraq is thirsty for American products as its economic growth outpaces even China's and India's. Doing business in Iraq can be challenging, but potentially very rewarding." Ambassador Krajeski noted, "Bahrain faces a range of challenges, but I am confident that Bahrain will realize its economic potential again. We are committed to helping Bahrain move beyond this difficult period, institute reforms, and restart economic growth. While the reasons for the recent unrest are complex, economic growth can help reinforce a transition to a more stable and prosperous future." The second panel focused on Diversifying Away from Hydrocarbons and was moderated by Hon. Alan Larson, Senior International Policy Advisor for the law firm of Covington & Burling and former Under Secretary of State for Economics. Panelists included: Hon. Henry Ensher, U.S. Ambassador to Algeria; Hon. Matthew Tueller, U.S. Ambassador to Kuwait; Hon. Richard Schmierer, U.S. Ambassador to Oman; Hon. Susan Ziadeh, U.S. Ambassador to Qatar; Hon. James Smith, U.S. Ambassador to Saudi Arabia; and, Hon. Michael Corbin, U.S. Ambassador to the United Arab Emirates. In introducing the panel, Ambassador Larson noted that, to avoid the "resource curse," countries could discourage excessive consumption, encourage productive investment in infrastructure and education, promote an entrepreneurial culture, and establish a pro-business regulatory regime. Ambassador Ensher stated, "Strong commercial relations are a key element in the strengthening bilateral ties between the United States and Algeria. While hydrocarbons will continue to be at the core of our commercial relations and will continue to promote our broad interest in diversity of energy supplies, there are also many opportunities in such areas as high technology, pharmaceuticals and agribusiness, in which U.S. expertise and quality are strongly respected in Algeria. U.S. Embassy personnel work every day to support our broad commercial ties, helping to close $3.61 billion in deals over the last eight years, which shows that maintaining an effective commercial presence at the Embassy is good value for money." Ambassador Tueller noted, "U.S. firms could be well positioned to succeed in Kuwait in a number of areas over the next 5-10 years, specifically in the fields of education, health care, telecommunications and information technology." Ambassador Corbin said, "The UAE is the largest market for American exports in the Middle East. The country is a major market for U.S goods and services, as well as a stable business environment for U.S. firms looking to operate in the region. In areas such as developed infrastructure, taxation, and facilitating trade with the GCC and beyond, the UAE is particularly competitive." The U.S. business community's strong interest in this event is a reflection of the growing commercial relationship between the United States and the Arab world. According to data recently analyzed by the National U.S.-Arab Chamber of Commerce, 2011 was a surprisingly good year for U.S. exports to the MENA region. Based on initial 2011 data and revised 2010 figures provided by the U.S. Census Bureau, U.S. goods exports to the Arab world increased from $48.77 billion in 2010 to $56.18 billion in 2011, an increase of 15.2 percent and the highest single-year sales volume ever. ​The Arab Spring is having an effect on investment and U.S. exports to certain countries in the region, but demand for U.S. goods and services remains strong. According to the U.S.-Arab Chamber, there are four key economic drivers in the U.S.-Arab commercial relationship: energy development (upstream and downstream), infrastructure development, consumerism (including purchases by youth, who constitute 70 percent of the region's population), and defense & security. The recent findings are consistent with the Chamber's research that shows U.S. exports of goods and services to the Arab world growing to $117 billion by the end of next year. Corporate sponsors for the event consisted of American and Arab companies representing a range of sectors, including Aramex (logistics), Dow Chemical (petrochemicals), DynCorp International (training & government services), Emaar (construction & engineering), General Dynamics (defense & security), and Qatar Airways (commercial airlines). Don De Marino, the Chamber's Co-Chair, summed up the importance of this first-ever Ambassadors' Forum. He concluded, "This unique event was exactly what this Chamber does so well, bringing together the best expertise in the region in innovative ways. I was delighted as NUSACC chairman to be able to be a part of it. I also want to pay tribute to Jasmin Silva Navarro and the entire NUSACC team for their hard work in making this event a success."